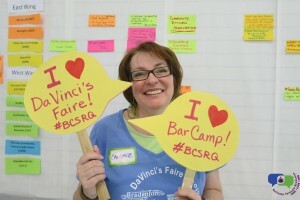 Volunteer for DaVinci's Faire and Contribute to an Amazing Community! What makes DaVinci’s Faire Special? Months ahead of time you start on social promotion, you invite friends, you recruit sponsors (which keeps the event FREE!) You greet people at registration, you hand out t-shirts, you speak in sessions, bring games and more. You work hard, and together we play hard and grow as a community. Going into our 9th year and our 19th day of DaVinci’s Faire and BarCamp, this volunteer led and directed event only happens because of YOU! What does it take to make DaVinci’s Faire happen each year? If you haven’t been a part of the team before, check out our volunteer positions below. See something that sounds like fun?